The Republic's top scorer Robbie Keane stretched his record to 24 goals as the Irish beat Croatia in a friendly at Lansdowne Road in Dublin. The Tottenham front man struck from close-range in the 24th minute after Damien Duff had created the opening. Duff beat two defenders to get to the bye-line before passing into the six-yard box for Keane to sidefoot home. The result means the Irish are now undefeated in the 14 home games played since Brian Kerr took over as manager. The Republic become only the third team to beat Croatia in 2004, following England and Germany. Croatia, without Rangers striker Dado Prso and first-choice goalkeeper Stipe Pletikosa, had the first chance after a loose pass from Irish central defender Richard Dunne. Although Dunne partly redeemed himself by blocking Darijo Srna's 18-yard shot, the rebound fell to Ivan Klasnic for a longer-range drive which was narrowly wide. For the Republic, Chelsea star Duff unleashed an angled drive which went inches beyond the far post. Then came Keane's goal, flicked in with his heel after the Duff pull-back. But the Republic almost blew the lead straight away when Jurica Vranjes powered in a downward header which flashed across the face of Paddy Kenny's goal and just past the left-hand upright. Half-time substitute Bosko Balaban almost equalised two minutes into the second half when his crisp drive beat Kenny, only for Liam Miller to head off the line. Duff missed a great chance to make it 2-0 to the Irish on 67 minutes. Liverpool utility man Steve Finnan was the provider again on the right flank but Duff, instead of meeting the cross with his head in front of goal, opted for a chest trap followed by a stabbed shot against the underside of the bar. Nine minutes from time, first-choice keeper Shay Given and Richard Dunne combined to protect Ireland's lead. Given, seconds after coming on as a substitute, got a touch on Eduardo da Silva's shot and Dunne brilliantly cleared off the goal-line. Celtic's Aiden McGeady got his first senior cap as a stoppage-time substitute for the Republic. 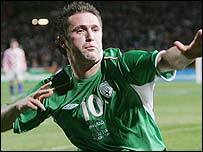 Republic of Ireland: Kenny, Finnan, Dunne, Breen, O'Shea, Miller, Kavanagh, Kilbane, Duff, Elliott, Keane. Subs: Maybury, Quinn, Cunningham, McGeady, Given, Barrett, Doherty, Lee, Colgan. Croatia: Butina, Tomas, Robert Kovac, Tudor, Simunic, Vranjes, Nico Kovac, Srna, Kranjcar, Babic, Klasnic. Subs: Balaban, Tokic, Vasilj, Neretljak, Ivan Leko, Pranjic, Eduardo.